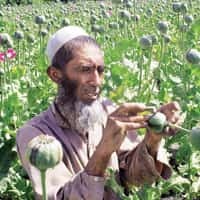 If you are worried about illicit drugs afflicting your college-going children you have profound reason, with farmers in Afghanistan now sowing what is expected to become the biggest and most lucrative opium poppy crop yet. For the poor farmers in this war-ravaged country, poppy harvests secure their livelihoods. It is, however, another matter that field upon field of beautiful bloom also fuels $400 billion worth of global trade in illicit drugs and several billion worth in arms trade. Should Afghan farmers be held responsible for misuse of opium that is known for its medicinal properties? Can they be dissuaded from growing poppy? They might oblige, provided alternative crops are as lucrative. Researchers have burnt their fingers with alternatives such as saffron and mint crops, none fetching as much as $122 to a kg for poppy. For negligible input costs and a longer shelf life, poppy remains the best bet. No surprise that opium’s export at $3 billion contributes 40% to Afghanistan’s GDP. Undoubtedly, there is good reason for farmers to grow opium poppy and for the rest of the world to be uneasy at the same time. Doesn’t this expose the world to the menace of drugs? So it seems, as the political economy of a country weakened by the ongoing war finds itself vulnerable to divisive forces that exercise control over people’s lives and livelihoods. With its growing influence, the Taliban have encouraged poppy cultivation to obtain a large part of their funding from trade in illicit narcotics. They have indeed been successful, unlike both the $100 billion a year war and the piecemeal efforts to wean farmers from growing poppy. The crucial question remains: if Afghanistan were to somehow reduce opium production, who would benefit? The Taliban and black market entrepreneurs, whose stockpiles of opium would skyrocket in value. Thousands of Afghan peasants would plant illegal crops, utilizing guerrilla farming methods to escape eradication efforts. It is a good time for the Afghan farmers though, even as the world debates its strategy to control opium growth. The crop of 2007 was up by more than one-third from 2006. The current annual harvest of 8,200 tonnes, more than 93% of the world’s harvest, is quite likely to be bettered next year. Afghan farmers make profits, but the problem is that they are producing 3,000 tonnes in excess of the global demand, fuelling illicit opium trade worth $20 billion. Poppy is a medicinal crop that the world can’t live without. Else, it would have long sprayed the crop to extinction. Heroin and morphine, two common drugs, can be derived from the gum in opium poppy seed heads. Morphine is in great demand as a painkiller: in North America, average annual morphine consumption is 55mg per person, in north Africa and West Asia, this plummets to 0.29mg per person, and in the Asia-Pacific region, it is 0.67mg per person. There’s no evidence to suggest that morphine is in short supply, as opium produced legally in India, Turkey, France, Spain and Australia meets most of the global demand. Yet, trade in illicit opium flourishes at the behest of the narcotics trade, which is 6% of the total world trade in goods. Not only is the opium economy deeply entrenched in politics, but its stakeholders are diverse and powerful, manipulating the demand-supply equilibrium. Internationally, the consensus is that the situation in Afghanistan is at crisis point, but there remains intense disagreement on the best course of action. First, it isn’t clear who the real enemy is: opium harvest or the terror network? While the United Nations Office in Drugs and Crime considers eradicating poppy as a means to control illicit drug trade, the US sees poppy eradication as an opportunity to decimate the Taliban. There are strong indications that if the next harvest is more than in 2007, the US will spray this coming year. If history has any lessons, the US will be knocking at the wrong door. The carrot-and-stick approach of crop eradication has already failed, since production usually gets shifted: opium production moved from Pakistan to Afghanistan; coca from Peru to Colombia; and cannabis from Mexico to the US. While impoverished farmers did suffer, the global supply remained unaffected. Is there a way out? The European Parliament’s committee on foreign affairs recently issued a report, asking the Afghan government to turn part of the poppy crop into legal analgesics, such as morphine and codeine. The Senlis Council, an international think tank with an office in Kabul, has sought control of opium production by local communities, with licence to produce morphine powder from their crop. The US state department is, of course, not convinced if “legalization is an option". One can only expect the British to agree, who wonder if the Afghanistan government is equipped to enforce legal provisions at the cost of confronting the narcotics traders. For the US and its allied forces, any excuse that justifies war is a trade-off worth considering. Opium is simply an excuse for the US to keep pounding Afghan territory. Can the world be immune to current developments in Afghanistan when its borders are porous to the outflow of illicit trade in drugs, arms and crime? India has invested in rebuilding efforts in the war-ravaged country, but has little contribution to building a clear perspective on poppy, drugs and terror.